This might surprise my loyal readers - hold steady dear friends - but I'm a little bit of a sci-fi geek. Yes, I still want to stand up and, I don't know, salute or something every time Capt. Picard comes on the television. But in seminary I discovered "the best show on television." And it wasn't on PBS. It was, in fact, Battlestar Galactica. 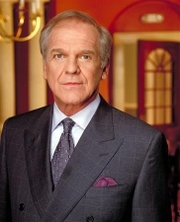 For those who've never watched the show it is a little like The West Wing meets Star Trek. Finally, after an entire year the show is returning. Thank God (or Gods, whatever). In this eight minute video you can catch up with three seasons of episodes and ready yourself for the April 4th season premiere. I swore to myself, by the way, never to mention this show on this blog but some things are just too good not to share. I write to you to express the outrage that I, and all Oregonians, feel regarding a recent event. I know there is a strong possibility that you may come back and say that you "don't recall" to what I am referring, so let me refresh your memory. Recently, 20th Century Fox launched The Simpson's Movie Springfield Challenge where people could vote on the real-life location of the home of The Simpsons. Naturally, most Oregonians felt confident that we would win, since it is obvious to everyone that Simpson's creator Matt Groening, who was raised in Oregon, modeled Springfield after his childhood home. Oregon has over 363 miles of the most beautiful coastline in America, the Cascade Mountains, and is the grass seed capital of the world. What does Vermont have? Maple syrup. This travesty must not stand. Springfield, Vermont is a town of only nine thousand people; yet this community received over fifteen thousand votes. Unless they passed a law giving cows the right to vote, this smacks of election fraud. It also once again highlights the need for electronic voting with a valid paper trail. Was Diebold in any way involved in tabulating the results? Additionally, it's my understanding that Springfield, Vermont entered the competition after the deadline. That's clearly an election violation since they should not have been listed on the ballot in the first place. Some people will say that we were rolled by the giant pink doughnut, but I believe there were significant voting irregularities. Knowing how passionately the Bush Administration feels about counting every vote, I'm sure you will want to investigate this matter. Additionally, I urge you to petition the Supreme Court to review the facts and consider whether or not this election should be set aside. Given the Court's recent rulings on election proceedings, I'm sure they will be eager to review the case. I demand that you investigate this miscarriage of justice and restore Oregon as the definitive home of The Simpsons. P.S. 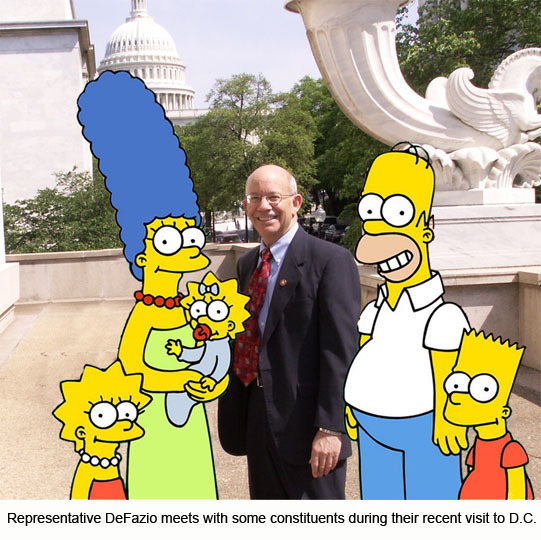 Also, to see proof beyond a shadow of a doubt where the real Simpsons are live, go to http://www.defazio.house.gov/images/zoom/LGKSWV/simpsonspad.jpg and see for yourself. Photos don't lie.